Authorities are continuing to investigate the 1980 disappearance of Denise Daneault. 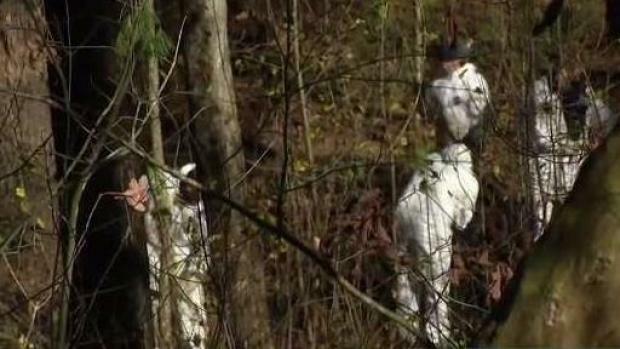 In the woods of Manchester, New Hampshire, FBI agents and local police are digging for any evidence that would heat up a cold case that is nearly four decades old. In the summer of 1980, Denise Ann Daneault disappeared. The 25-year-old mother of two went out for a night downtown and was never seen or heard from again. The report of her disappearance was a footnote in the Union Leader three days later. On the 38th page, the headline read "Young Mother Missing, Two Sons Miss Her." Police scoured the woods off Kimball Road in Manchester, New Hampshire, on Sunday, in connection with the Denise Daneault cold case. The Manchester woman went missing in 1980 when she was 25 years old. A friend of hers says seeing police show up with shovels shatters her hope for a different ending. Tuesday, police were searching near Kimball Street. On one side is an apartment complex, and on the other is a heavily wooded area where the array of green is broken up by investigators in white jumpsuits. This is the second time they are searching this area. Last November, investigators were in the same woods. The senior assistant to the attorney general says the search wasn't completed in November, which brought them back to the same location Tuesday. "I think if I'm going to say anything, it's that people should know that this was a good woman, a good person, a good mother who loved her sons more than anything," said Marie Stevens, a friend of Daneault. She said it's "maddening" that no one was ever held responsible for whatever happened to her friend. Stevens said Deanault was "fearing for her life" in 1980 as if someone was following her after she received a threatening letter. "She actually came over and showed it to me and said, 'Look at this' and it was awful," said Stevens. "[It said] 'You're going to die if you don't do this' and she said, 'What should I do with this?' and I said, 'You throw that away. That's garbage' and I ripped it up and threw it in my garbage. Now I wish I had that letter." It's not clear how long investigators will be at the woods in Manchester. Anyone with information is asked to call 603-792-5519.